This is a small part of my Army Enlisted men's and Army Officers's Collar Service Devices, worn on coats and shirt collars. It consists of original collar disks or collar insignia of- or related to the 83rd Infantry Division during World War One. First you can find a small history of the Enlisted and Officers collar devices. The use of collar insignia began with the War Department Circular No.68 dated October 8, 1907: On and after 1 July 1908, the collar ornaments will consist of dull-finished bronze metal buttons, attached to the collar, two on each side, by means of a treaded post and thumbscrew nut. The buttons will be one inch in diameter, with raised edge, one showing in relief in the center the letters U.S., gothic design, and the other the insignia of the corps, department, or arm of service, according to sealed patterns in the office of the Quartermaster General. The disc was to be made of a coper or a bronzed metal. The color of the disc was produced by using acid and akali solutions, the disc would then be lacquered. Collar discs can appear in many different colors, from black to bronze and every shade in between. The design of the collar disc would undergo numerous changes throughout its use with the U.S. Army. The U.S. or state disc was always worn on the right collar, and the corps, department, regiment or company disc was worn on the left side. The first discs worn in 1908 had the regimental numbers and the company letters on the left branch collar disc. The U.S. or state disc remained plain. In 1917, the regimental number was moved to the U.S. disc, and the company letter remained on the left branch disc. By 1918, the Army started to simplify the insignia, and many of the replacement soldiers in Europe wore plain U.S. and branch insignia discs. In 1916 and again in 1917, the united States Army was broken down into five components. The first component was the regular Army made up of the professional soldiers. The second component was the National Guard consisting of all of the states citizen soldiers. The third was the National Army made up of draftees. The fourth component was a Volunteer Army consisting of individual volunteers. Finally the fifth component was the Enlisted Reserve. Each of these components warranted its own specific collar disc. These specific U.S. discs would also evolve as the war progressed, and by the end of the conflict be simplified into one style of discs for universal use. After the spring of 1918 the Army started to standardize the U.S. discs for all of the different Army components. The National Guard, the National Army and Enlisted Reserve insignia were all issued until supplies were gone. The Volunteer Army disc was no longer needed because the volunteers were all assigned to regular units. The regular Army U.S. disc would start to become the universal collar insignia for all of the Army components. However, soldiers in Europe would continiue to wear an assortment of disc styles until the older supplies had run out. Branch Collar Discs are extremely varied and can be very confusing for anyone attempting to research them. The reason for the numerous styles and desings of branch discs can de traced to two major factors. First, the US Army changed regimental numbers, company letter designations, and the basic designs on numerous occasions leading up to and during the First World War. The second reason for the confusion is the numerous manufacturers of the discs. Many times these manufactures did not follow the Army regulations, or they just took liberties with the specified design. These two major factors caused branch insignia discs to come in all sorts of different patterns, designs and styles. It must be remembred that prior to 1917, both the company letter and regimental number were worn on the branch disc. After 1917, just the company letter was worn on the branch disc, and many discs were standarized with no company letter or regimental nummber at all. Many collar discs are of European manufacture, mainly from France. Some discs ware made in Germany during the occupation. These foreign discs are fairly distinguishable from American made discs. French discs are usually brown enamel or a brownisch color and they are made from thinner metal. Most French made discs were fastened using a wire catch and oval shaped loop. Other French Discs used a pin attachment. Post war German discs were generally made of a gray metal painted black. Many of these discs were of two-piece construction resembling a button. Most German discs had the manufacturers name one the back. German discs used a screw fastener or just a button style loop so that it could be sewn onto the tunic. Officer collar insignia followed the same design requirements as the enlisted man's insignia. Officers did not wear their insignia on a disc. Instead officers wore a cut out of the U.S. and of the branch insignia. The officer collar insignia was a dulled or blackened bronze metal. Officer insignia was primarily pin back with a curved safety latch. Officers would wear the U.S. towards the front of each collar, with the branch insignia behind. Front line officers would in many cases wear their shirt collars over the tunic to hide the insignia, or many would just remove the insignia altogether. Officers insignia could be a target for snipers. Regular Army officers wore a plain U.S., National Army and National Guard officers wore the U.S. with the NA or NG in the middle, and Reserve officers wore a U.S.R. In some cases regimental numbers were worn on the branch insignia. Bronze Left sided Collar Disc Type I US Made with the treaded and tumb screw nut (Screwback). A prior to 1917 period copy, both the company letter and regimental number were worn on the branch disc. Officers Infantry Collar Insignia 329 Reg. Type of Officers insignia with the treaded and tumb screw nut (screwback). The numbers are attached to a curved bar on the back. Note the small screwbacks on the back of the insignia. A post 1923 period copy. Harder to find Interwar Officers Collar Insignia for the 329th Infantry Regiment. The 83rd Divison did not exist as a fully operational Infantry Division but a cadre of officers remained. Officers Field Artillery Collar Insignia 323 Bn. 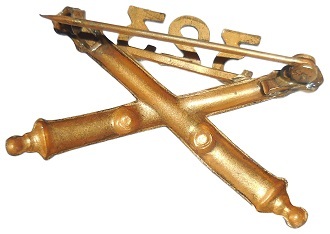 Type of Officers insignia that has the WWI pin back fastener with a curved safety latch. The numbers are attached to a curved bar on the back. I suspect this is an early post WWI period copy because it is larger than other types. Most likely private purchase and worn between WWI and WWII.